Even some of the most stunning women often have to resort to concealers and makeup to hide their dark circles. Not only do these under-eye circles make you look much older than what you actually are, but they also have you looking ill or unhealthy. Before we even begin this natural journey, let me tell you that dark circles take the time to cure and require great discipline. A regular skin and health care program should be followed, by the book, so do not expect magic to happen overnight. Lack of proper intake of water – It is important to flush out toxins from your body constantly and store them lest they harm you. Start with at least 10-12 glasses of water in your daily intake. Haemoglobin Levels – You need to also check on internal problems with regards to your hemoglobin levels and get an appointment with your doctor to see if there is an internal weakness for which you may have to take vitamin supplements. This, however, can also be substituted with a high protein and balanced diet. Genetic causes – Many times, the reason for dark circles may be genetic and not be directly related to your nutritional intake. In such a case, you will not be able to get rid of them completely but once worked on properly, will definitely be able to reduce them drastically. Sleeplessness – For the night owls who party hard, smoke or drink, dark circles are bound to appear. Balance out your lifestyle and get proper rest. Stress –Most people who are very stressed out also have sleep problems. Either they suffer from disturbed sleep and toss and turn or due to incessantly thinking don’t get to sleep. They often wake up groggy in the morning. Lack of proper diet – Junk, preservative-heavy food and lack of fresh salads and adequate nourishing food in your diet will also cause the skin to look sallow and give you dark circles. 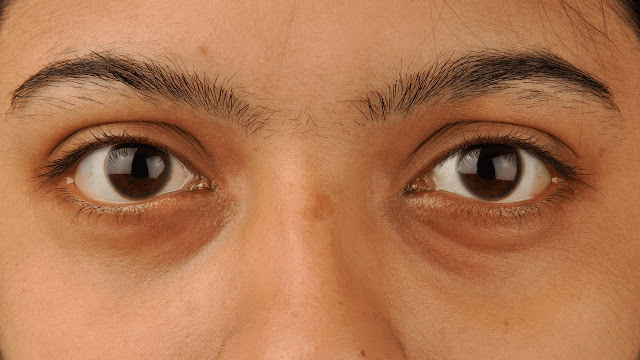 Prolonged illness – When recovering from a long illness, dark circles could begin to appear due to internal weakness. Computer hours – Long hours in front of the computer can be harrowing for the eyes and can lead to eye stress and dark circles. Cup your eyes in your palms every hour to relax eye muscles and improve blood circulation. You can start with the age-old cucumber or cabbage soaked in boiling water (and allowed to cool) applied directly to your eye sockets. Squeeze excess moisture from two tea bags that were recently used, (optionally squeeze a little cucumber or cabbage juice onto the tea bags) and place one tea bag on top of the darkened circle under each eye. Remove the tea bags after 15 or 20 minutes. Crush 1 tablespoon of any of the following herbs (can make a mixture) of basil, cilantro, parsley into a mashed mix of any mix of the following tomatoes, cucumber, cabbage, spinach and blend well. Apply a little around your eye area, leave on for ten minutes then wash off. Repeat daily. 1/4 cup of soybean oil and/or Almond oil. Add crushed parsley, basil and or cilantro leaves and a 1-inch cube of cucumber to this oil and leave soaking as an infusion. You can also add lemon or orange zest (skin) for a very powerful anti-dark circles remedy. Either rub this oil onto cucumber slices and apply to your eye sockets or dab this oil serum around your eyes before bed and first thing in the morning. This is an AMAZING serum – it’s very potent – store it in a cool place out of light. Used regularly you will see a big difference within days. These are just a few recipes – I picked the best ones for you they are so simple but work really well. Even better than learning how to get rid of dark circles is learning how to prevent them. Get between seven and nine consecutive hours of sleep each night. Also, stay hydrated by drinking between six and eight glasses of water each day. This flushes away toxins that can contribute to issues including dark circles under eyes. With these wonderful natural recipes, you are now geared up to reduce dark circles. But let me warn you, no skin care routine can ever be complete without its magical ingredient and that is regularity and discipline. So start right away! And remember to be patient with organics. Let me know your thought below.